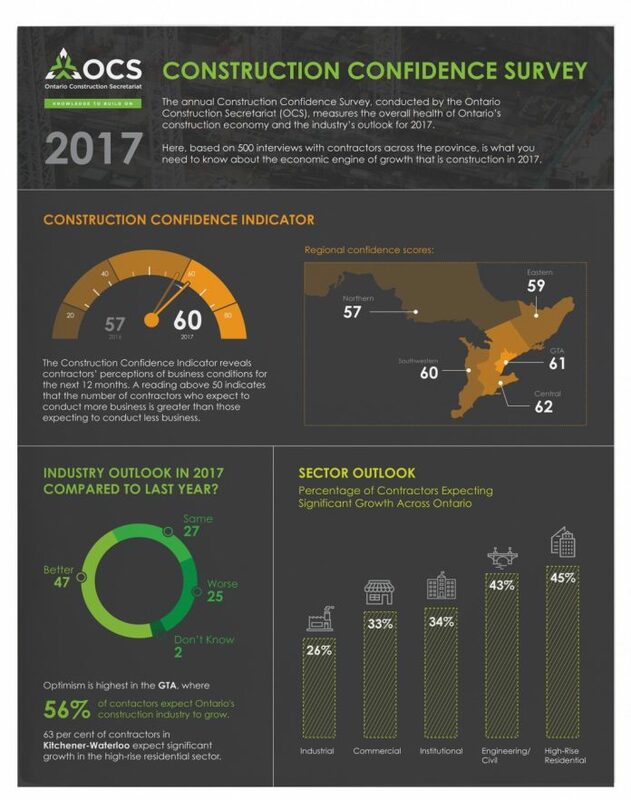 The economic outlook for Ontario’s construction industry is positive and confidence has increased across the province, according to findings from the 2017 Construction Confidence Indicator, an annual survey of construction contractors conducted by the Ontario Construction Secretariat (OCS). 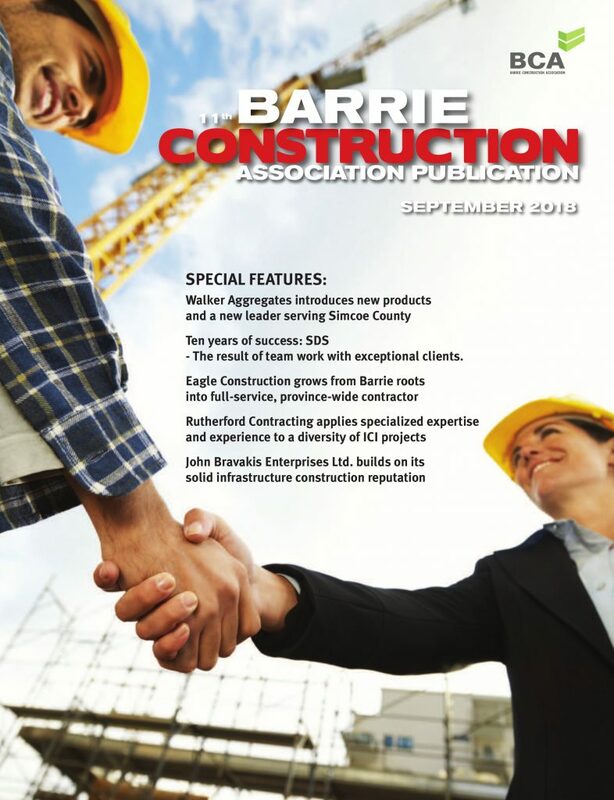 With a score of 60 out of 100, the confidence indicator reveals a majority of Ontario’s construction firms expect to conduct more business this year than last. 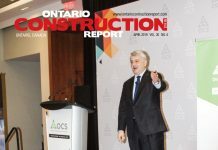 The indicator was released as part of the OCS’s 17th annual State of The Industry & Outlook Conference at the Metro Toronto Convention Centre on March 9. According to detailed regional data, Central Ontario is the most confident with a confidence score of 62, followed closely by the GTA with a score of 61. Northern Ontario reports the lowest confidence with a score of 57, however, optimism has nevertheless improved since 2016. Significant investment is being made in post-secondary education facilities in Northern Ontario including major projects at Laurentian University, Canadore and Confederation College. Dawn Desjardins, deputy chief economist of RBC, who delivered the conference’s keynote address, says the findings aren’t surprising. The Construction Confidence Indicator analyzes expectations of growth across five construction sectors – industrial, commercial, engineering/civil, institutional and high-rise residential. The results show that across the province in the non-residential sector, contractors expect to see the most growth in the engineering/civil category with 43 per cent of respondents anticipating “significant growth” in 2017. Expectations for “significant growth” in this sector are highest in Eastern Ontario at 57 per cent. Contractors expect the high-rise residential sector to be a stronger performer in 2017. 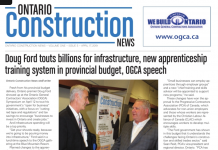 Overall across Ontario, 45 per cent of contractors anticipate “significant growth” in this sector. Kitchener-Waterloo leads the province in high-rise residential optimism with 63 per cent of contractors anticipating “significant growth”, most likely a direct spin-off from the construction of new light rail transit. Despite the boost in overall confidence, nearly half of the 500 contractors surveyed report they expect the Trump Presidency to have a negative or harmful effect on Ontario’s economy and construction industry. This sentiment is most acute in Windsor-Sarnia where 59 per cent of respondents believe Trump’s government will harm Ontario’s economy. 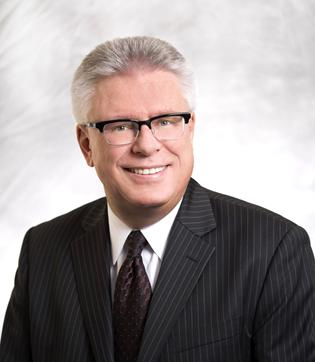 Alternatively, opinion in Hamilton-Niagara appears polarized with 40 per cent of firms forecasting the Trump Presidency will have a positive impact on Ontario’s economy and 44 per cent predicting a negative effect. Three common sources of concern include increased construction material costs, negative impact on the manufacturing industry and decreasing investment in projects due to economic uncertainty. The confidence indicator also looks at employment trends. This year’s survey shows an 11 per cent increase in apprenticeship employment in the unionized construction sector over the past two years, while the non-unionized sector has only seen a three per cent increase. Eighty-three per cent of unionized firms employ apprentices compared to 49 per cent of non-union firms. Great news overall – the importance of hiring apprentices cannot be understated. 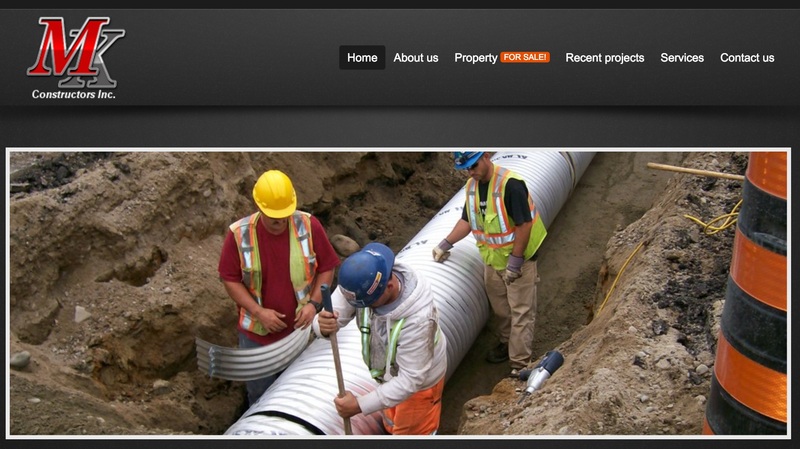 The raw talent is out there just waiting to fill the needs of Ontario’s construction companies. The future of our industry depends on them.